I’m going to go ahead and say that you need some ice cream this week. I know I sure as heck do. Between current day politics (I never get political on my blog, but omg my head hurts), social media craziness (Snapchat is changing its name to “Snap”?! Facebook has been lying about video ad metrics?! ), and just plain being overtired (please give me some tips on shutting down at night), I think I deserve a bowl of ice cream or two. And beer. That’s also necessary. And I think you deserve it, too. Well, I just made things a little bit easier for you and combined the two of them. Yup, I make it my business to make your life easier. All I want is for you to be able to come home from work, take off your shoes, and put on your sweatpants and get on the couch. Preferably with a spoon and a pint (of ice cream/beer/beer ice cream) and some mindless entertainment on television. Or maybe that’s really actually what I want for me… But I’ll find a way to make sure you benefit, too. OK, so first you’ll have to make the ice cream… But it’s pretty easy to do and mostly consists of a lot of waiting around while it chills in the fridge and freezer. I recommend you make it on the weekend, so you have the entire week to come home from work and eat it. Because that’s pretty much a life goal right there. 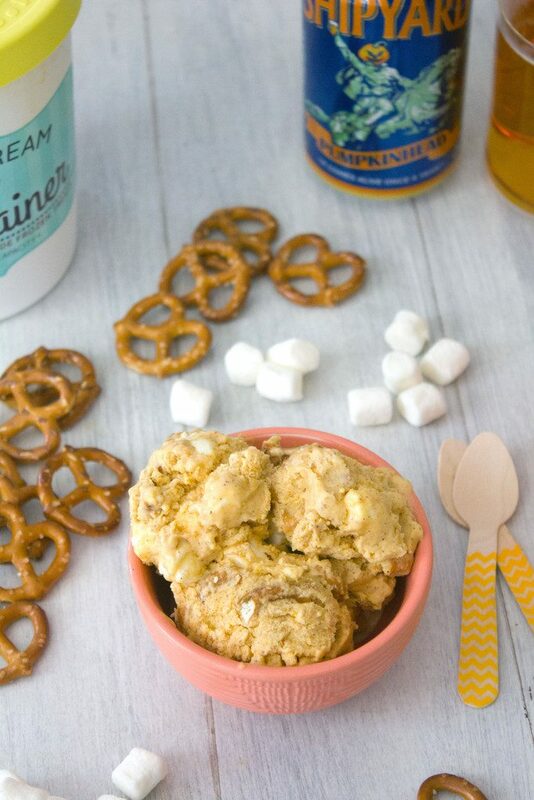 The ice cream is made with pumpkin beer. 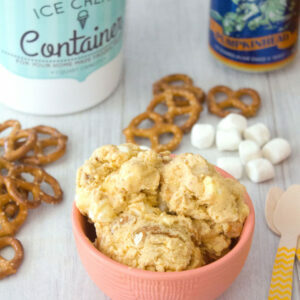 Because I was thinking about what could be better than pumpkin ice cream and I decided that was pumpkin beer ice cream. But I wanted other goodies involved, too, like pretzels and mini marshmallows. I’ve never been much for plain ice cream and love when it’s chock full of candy/chocolate/treats. And guess what? I’ve determined that this ice cream will cure all that ails you. Or at least most of it. It might not bring world peace, but it’s sure as close as I’m going to get. But really, this ice cream hereby steals the position of my most favorite ice cream I’ve made to date. It not only has full pumpkin spice flavor, but you can totally tell that the pumpkin flavor is coming from beer. Do you know how happy this makes me?? I also recently realized that I failed to make ice cream all summer long, which is pretty much a travesty. My poor ice cream bowl was sitting at the bottom of my freezer, home to bags of frozen fruit, instead of sugary, creamy goodness. But to be honest, fall and holiday-time are my favorite seasons to make ice cream. So many awesome flavors can be dreamt up this time of year. You can use any pumpkin beer of your choosing, but I opted for Shipyard because I think it’s one of the most solid pumpkin beers around. It’s perfectly spiced… And I know from experience and an annual pumpkin beer taste tasting (of 16+ pumpkin beers) that perfectly spiced is tough to find. While the ice cream is custard-based, the beer is added after the custard is made, so nothing silly like the alcohol burning off happens with this ice cream. Isn’t that the worst?? In the midst of all the ridiculousness of the world, I walked to the train today in 38-degree weather. 38 degrees. That is not OK. I went from not needing a jacket at all to seriously considering getting my winter coat out. And now it’s going to rain for the rest of the week. Which is probably the world’s way of telling us it’s greatly saddened by our state of affairs. World… have some pumpkin beer ice cream. Please note that I don’t like to encourage excessive drinking, but I do highly recommend you drink a pumpkin beer alongside this pumpkin ice cream. Especially on Mondays, debate nights, and any day that you get under 6 hours of sleep. Also note that my dog loves ice cream and sat and stared at me the whole time I made this and ate this. Which in total time was about 14 hours. Poor deprived pumpkin-loving pup. What’s your favorite fall ice cream flavor? Pumpkin spice is nice, but pumpkin beer is better! 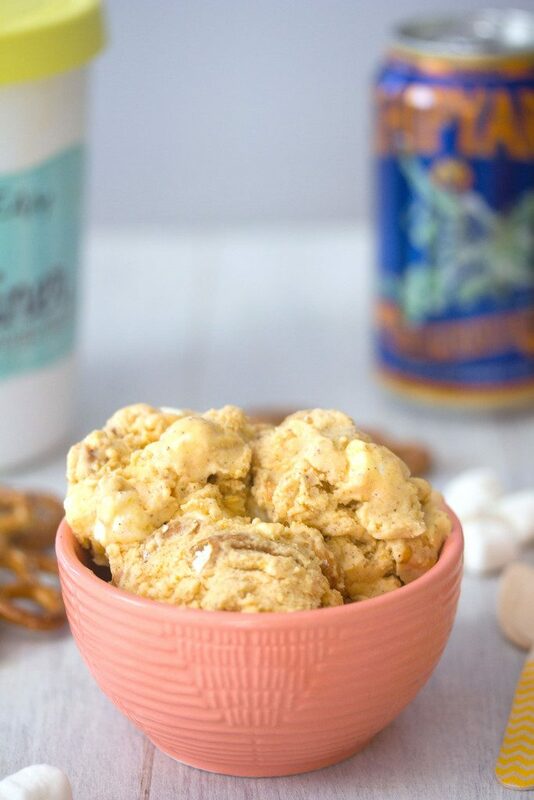 This Pumpkin Beer Ice Cream is packed with pumpkin flavor, along with plenty of pretzels and marshmallows. In a medium saucepan, heat cream, milk, and sugar over medium heat. Stirring constantly, let mixture reach just the point of simmer before removing from heat. Lightly whisk egg yolks, cinnamon, ginger, nutmeg, and salt in a separate bowl. Slowly pour about half of the warm cream/milk mixture into the bowl with the yolks, whisking continuously. Then pour egg/cream mixture back into the saucepan with the rest of the cream mixture. 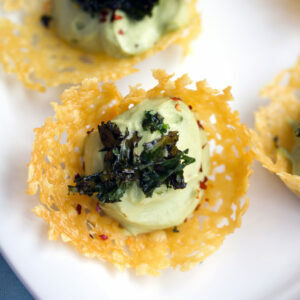 Continue to cook over low heat, while whisking. When the mixture thickens enough to coat the back of the spoon, after about 5-7 minutes, remove the saucepan from heat. Strain cream mixture into a bowl. Stir in pumpkin beer and pumpkin puree. Cover bowl with plastic wrap so that plastic is touching top of cream mixture (this will prevent a skin from forming). 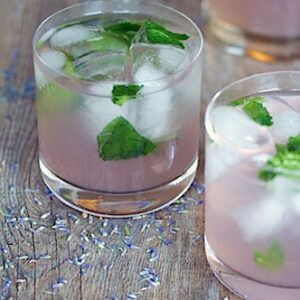 Refrigerate until chilled, at least 5 hours. 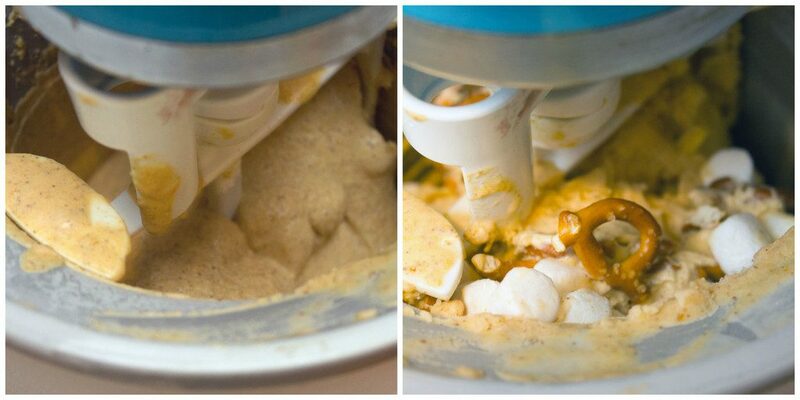 Once mixture is chilled, freeze in an ice cream maker according to the manufacturer’s instructions. 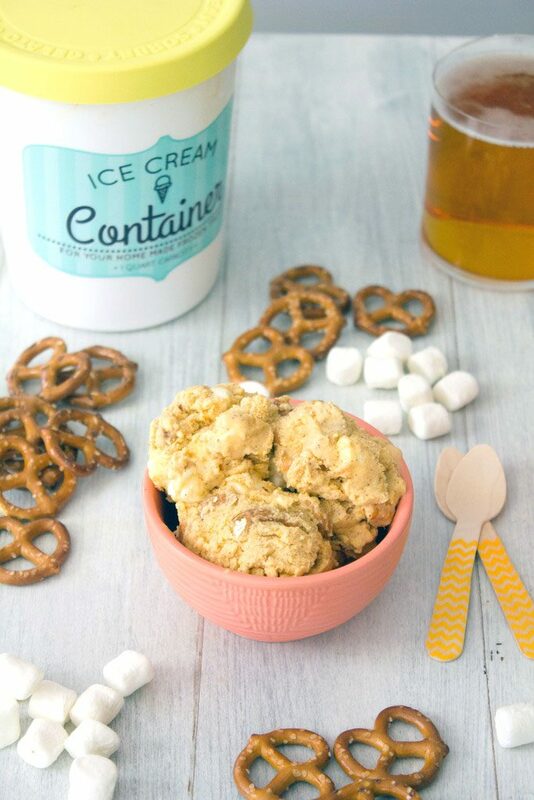 When ice cream is almost frozen, mix in pretzels and mini marshmallows. When ice cream is frozen, remove to airtight containers and place in freezer for at least 4 hours to continue to harden. 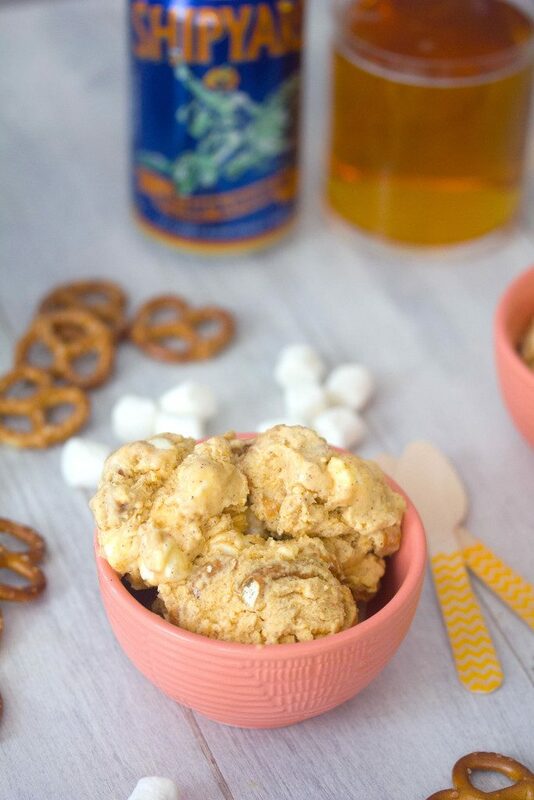 8 Responses to "Pumpkin Beer Ice Cream with Pretzels and Marshmallows"
I just made a pumpkin ice cream with rum (probably posting that on Sunday…). What a great idea to add pumpkin beer! I totally was forgoing beer tonight to get ice cream at Salt & Straw. But now you have me thinking about a possible beer and ice cream pairing….haha. 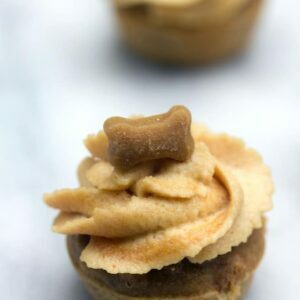 This is combining two favorites and is perfect for fall! I really like the color too! 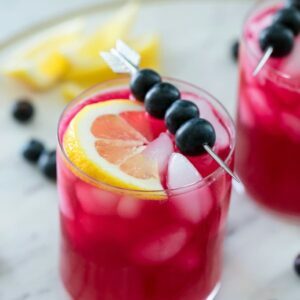 Yummm this looks delicious! I love ice cream year round. Not the biggest fan of beer, but pumpkin beer is probably one of the few kinds I do like. So this sounds perfect to me right about now. 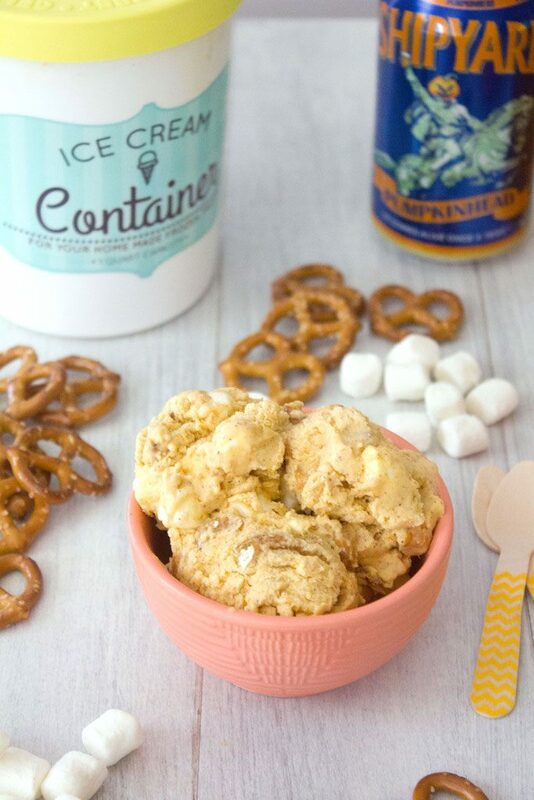 I’ll take two huge scoops of this pumpkin beer ice cream, please and thank you! OMG, this ice cream sounds and looks fabulous Sues…I can have ice cream anytime…this is sure perfect for the season. Ice cream is definitely needed this week! Love the flavor! I’ll take a big bowl please! Ummm, how did I miss this one? I know this will never go out of season. Pinning now to my ice cream board and headed to look for pumpkin beer tomorrow!